Alright!! So glad to officially join the Headless club. My Vader 7 is truly a pleasure and inspiration to play!! 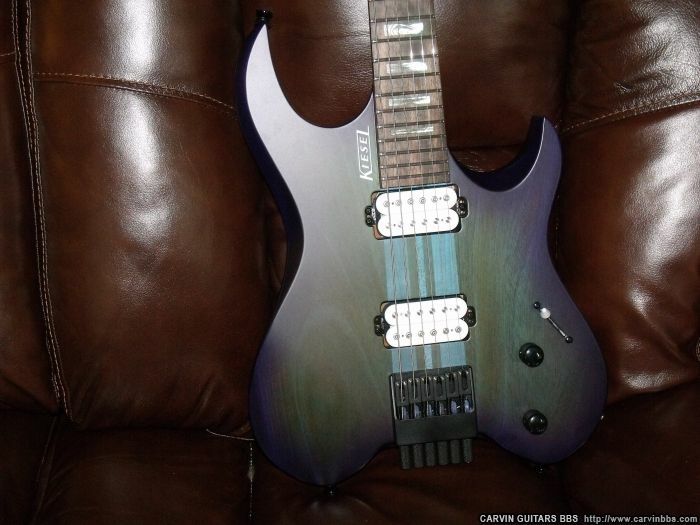 Thanks again Kiesel...already planning another!! Need to get some more pics, but here is one of my favorites so far! 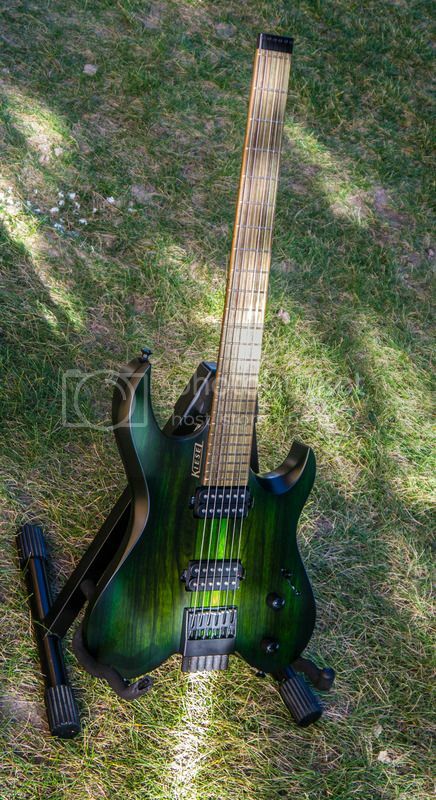 Has anyone shipped a guitar to the UK yet (since Carvin went fully direct) and if so have you any advice on best practice and budgeting for import costs? 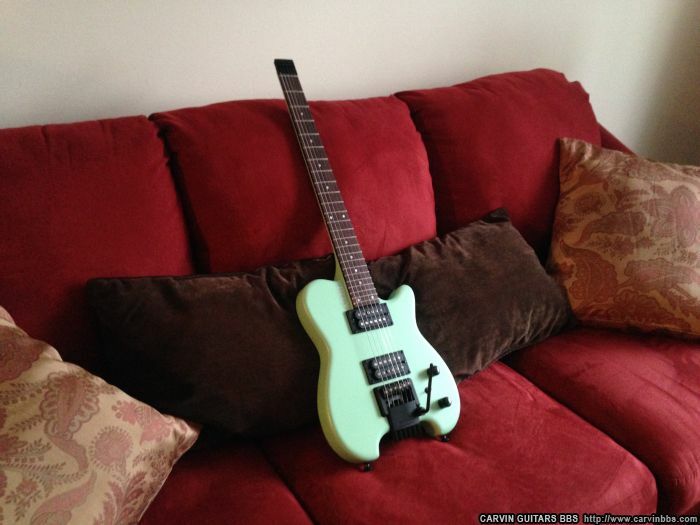 The online guitar builder has a few short-comings and I'm about to start correspondence with the sales team. Does anyone know whether a solid white back and sides would be available with a flame maple top? Also, is Faded Denim still an option? Good to see you around. I agree that it is time to get another HH1X in the pipeline! I am doing the same. I would email Chris, Mike Jones, or Keith Ighner to answer your questions regarding shipping and paint/finish possibilities. 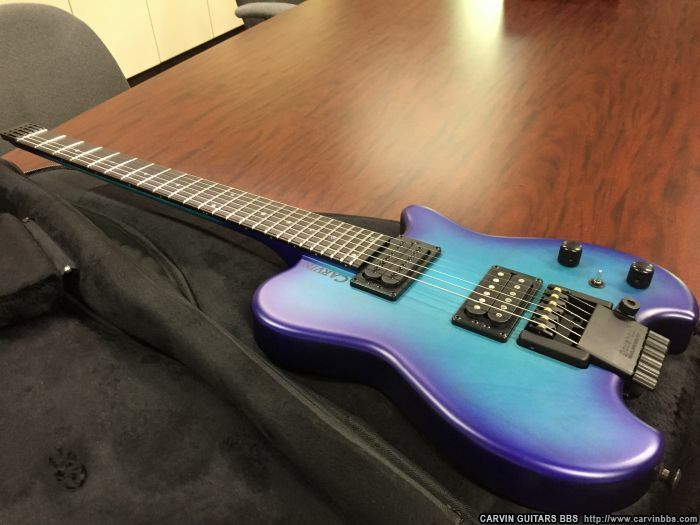 Publius77 wrote: Has anyone shipped a guitar to the UK yet (since Carvin went fully direct) and if so have you any advice on best practice and budgeting for import costs? Check out the link below, I've prepared an example of preliminary custom duty budget for the pre-estimated values. You may want to update them accordingly. 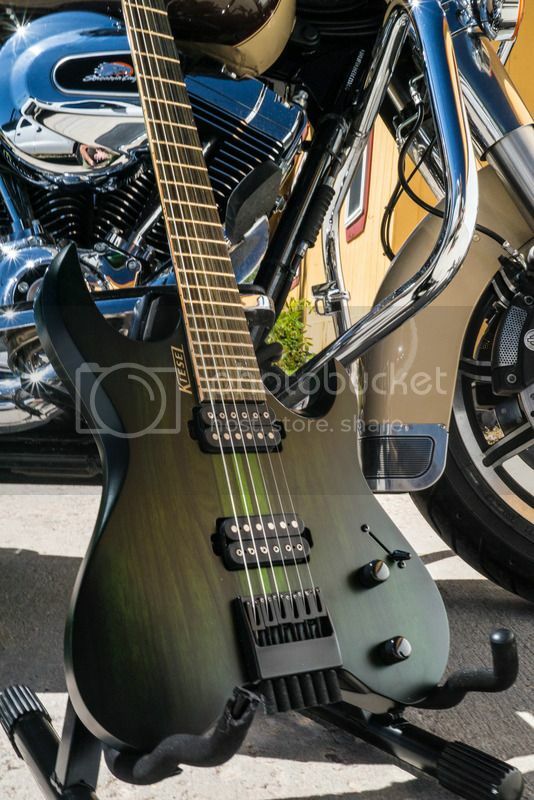 And make sure you have the Kiesel Holdsworth pickup installed in your new build. Use the bottom link in my post signature section to hear the tone, if you're curious. Mine will be here Saturday and look a lot like the one in Toecutter's post. reentune wrote: Mine will be here Saturday and look a lot like the one in Toecutter's post. That is a killer guitar. My favorite V7 yet. Simple, none more black. Photographer I am not but here are a few shots. The brighter photos were taken under florescent light and reflect a more true representation of the color. 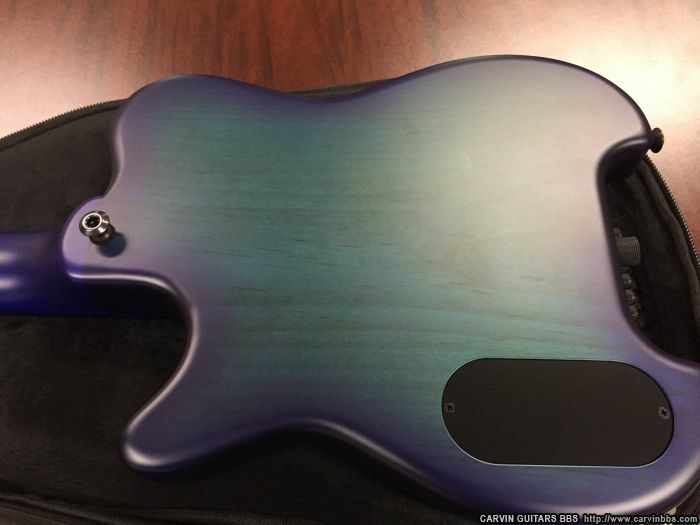 I was concerned that the aqua part of the niteburst would have some darker green streaks that I've seen in some other plain top guitars, but this one looks good. 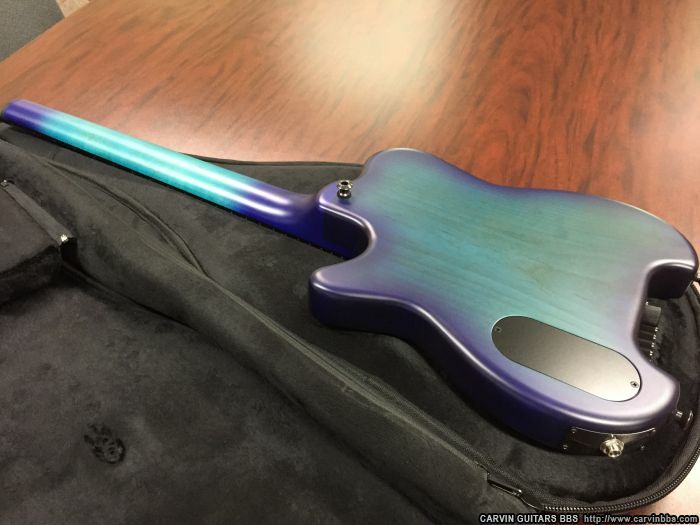 The back grain of the guitar does show some of the color I was trying to avoid. It don't care about the back, but I wanted to show it for reference. The neck feels great. I don't know why I had such a hard time with my ST300. This feels really good, and the neck heal really isn't a problem either as I don't even think about it when playing. 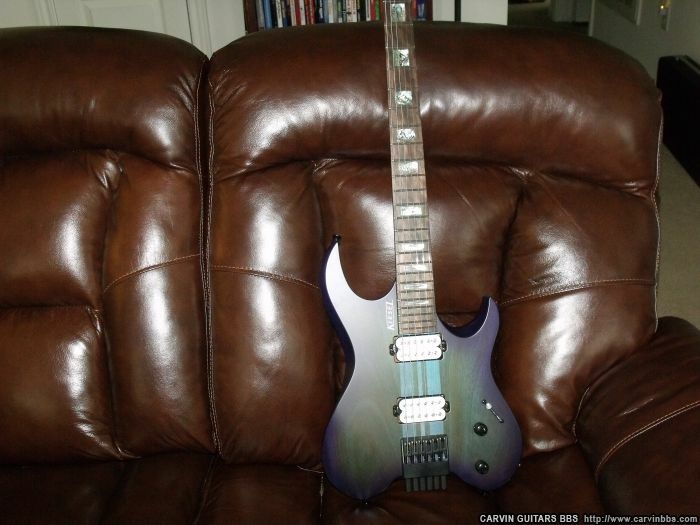 It's significantly different than my Ibanez 1570 but no problem at all adapting. 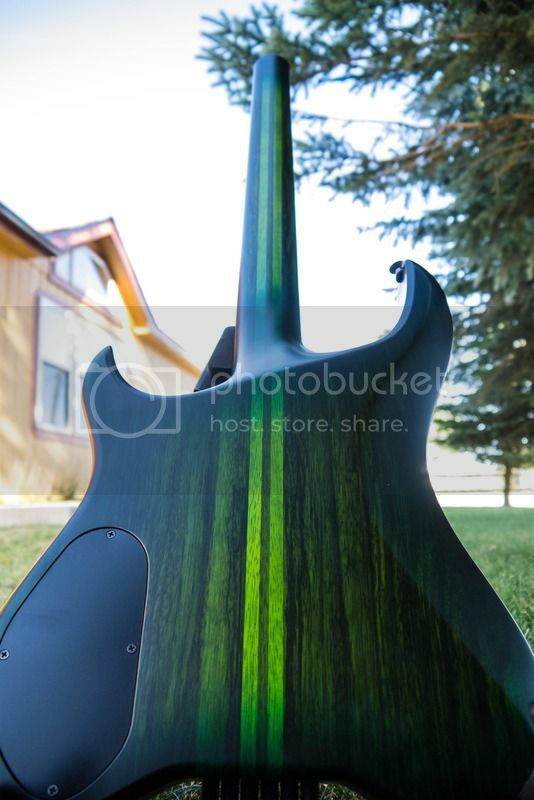 Also, I love that there is a good amount of fret beside the stings and the edge of the board. I love the SS frets. Fretwork is perfect. The ebony board is the best I've seen. It's jet black. Exactly what I wanted. The 20 inch radius is excellent. If anyone is wondering. Even bar chords are easy to play. It's flat, but it's not that flat. Look at a small table that's about 20 inches in radius. There's still quite a bit of curve to the edge. The JCustom trem is really comfortable when you set your hand lightly on the saddles or even behind. Also, even when not locked you can bend and not bring the other strings out of tune. If anything, only a cent or two. The sustain is the best that I've personlly experienced. The guitar is very loud acoustically, too. I find it actually overpowers my monitor when I'm playing at late night volume! I like the pickups. I've only owned about twenty guitars so I don't have a huge abount of experience with different pickups, and I find that you can usually get what you need out of any decent set. What I primarily look for is clarity when playing hign gain. THe KLB does that nicely. Neck pickup sounds great, too. Clean or in your face. I read about some issues people were having with the zero fret. It's not really a big deal for me. 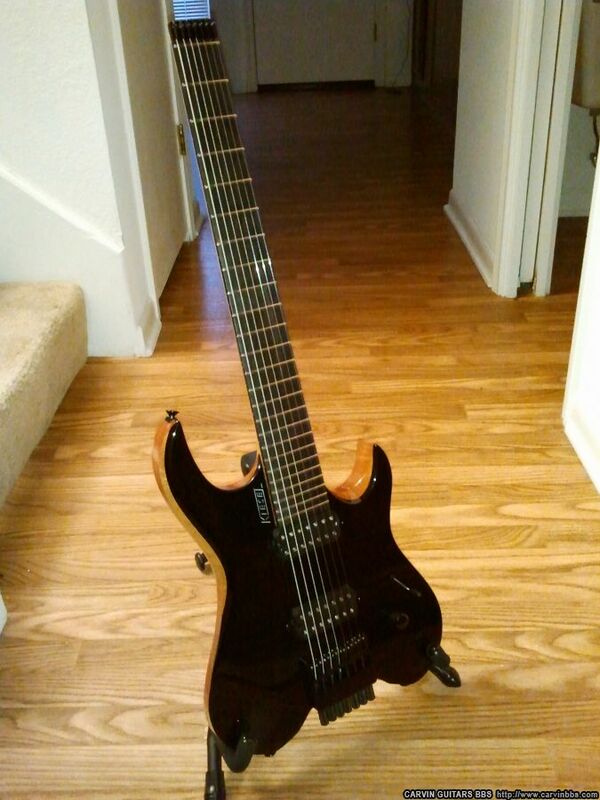 It can move a little depending on the bend and how close to the fret you are, but I don't really notice it. In other words, I wouldn't let that keep me from playing this or getting another zero fret guitar. I've ordered double ball stings so maybe that helps a bit. As an experiment. I took a capo and cranked it down on the fret. It seemed to work so if someone is really bothered by it, a device could easily be made to mimic the action of the capo. I ordered some La Bella and D'Addario stings but don't have them yet. Does anyone know what the trick is to get the ball end so that it's not exposed at the bridge? There are a few things I don't like. None of which are a big deal and they can all be fixed. The zero fret is much higher that it needs to be. There's no reason for it. I'll eventually have to get it fixed. 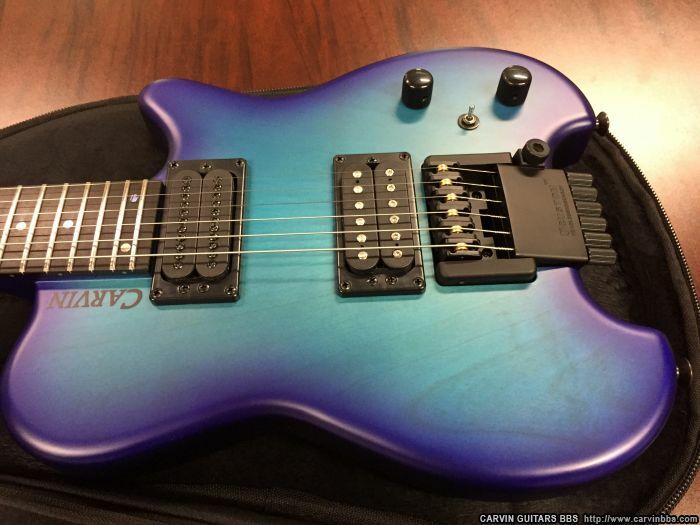 Nothing to do with Carvin but the trem arm collar is loose. Easy fix with plumbers tape but why not engineer it right in the first place? Also, the angle of the bar is too high. I'll need to bend it to something more reasonable. I haven't had time to put the trem through it's paces but is seems stable. More to come on that later. Finally, I'm getting some noise that may be due to the ground that connects to the trem. I'm not any where near an expert with guitar electronics but maybe someone can chime in. I'm using a high gain setting on my modeler. It's pretty quiet when not touching the guitar at all. Touching the strings or the jack does make a slight difference but this is normal for any guitar. Now, if I put my hand over the bridge pickup I get strong buzz. I'm not even touching the stings yet. If I touch the strings with my left hand (fret hand), the buzz goes down a bit but is still there. The neck pickup does not exhibit this behavior. So I'm getting buzz from my right had being over the pickup even when touching the strings. Of course, my hand is alway over the pickup so I'm hearing this all the time. Finally, touching the jack makes it dead quite. I'm guessing the ground isn't making a strong connection to the trem. but I'm not sure. I'll appreciate any suggestions. Edit: I should clarify that the buzz goes away when I make good contact with my left hand and don't move the right hand, but if I move the right hand over the pickup area a little buzz will still come through. Last edited by johnnyninja on Thu Sep 17, 2015 5:36 am, edited 2 times in total. As for getting the ball ends to fit under the bridge, there seems to be a recent manufacturing change to the JCustom headpiece. This change causes the ball ends to sit about 3mm higher up in the headpiece than the older version. Consequently, this removes the extra 3mm of slack in the string length that would normally be available to get the ball end hidden completely under the bridge. A few of us inquired about it and "don't worry about it" was the reply. My new koa HH1X has the newer headpiece and my alder/maple the older one. I guess I better get mine in here. The guitar looks great. Love the wood grain with that green. One of my favorite colors for a guitar. My noise issue reported above has been solved. This issue was related to the ground connection. I pulled the trem and sanded the bottom corner to clean up any paint residue that remained from their sanding. They did a good job, but since I had the bridge in my hand I wanted to be thorough. The main issue was that the wire was not placed in the best position and needed to be twisted up a bit. I repositioned the wire in the best place that made full contact with the metal (there are holes in the bridge that need to be avoided) and attached the bridge again. Problem solved. Easy fix other than having to intonate the guitar again. We all know how much fun that is. johnnyninja wrote: My noise issue reported above has been solved. Anyone have any ideas for alternate strap pin placement? 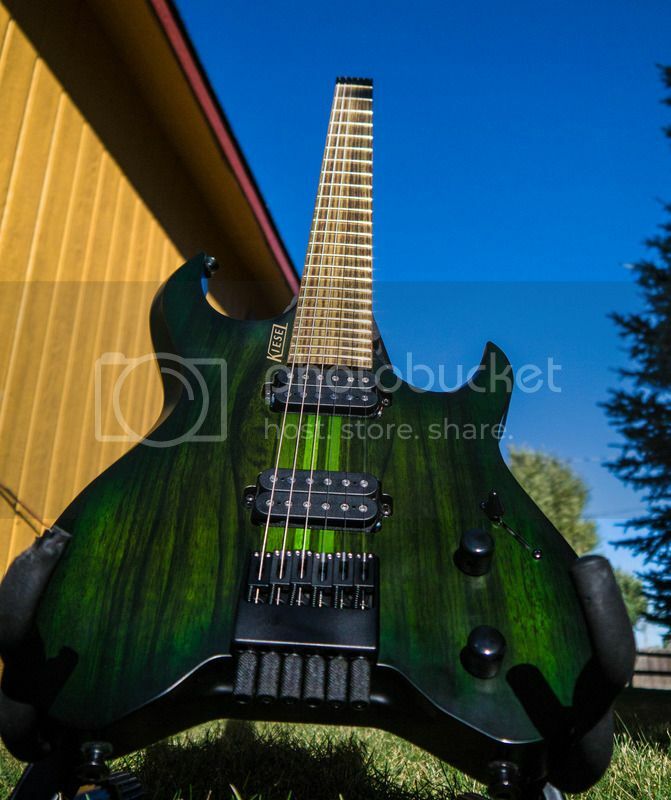 I have the Dunlop locking setup and Carvin strap but I'm looking for some other ideas. It's hard to move around a good bit when playing with the current setup. I miss my old DiMarzio ClipLock setup. shpence wrote: Anyone have any ideas for alternate strap pin placement? I have the Dunlop locking setup and Carvin strap but I'm looking for some other ideas. It's hard to move around a good bit when playing with the current setup. I miss my old DiMarzio ClipLock setup. I use a bit of a hybrid setup. 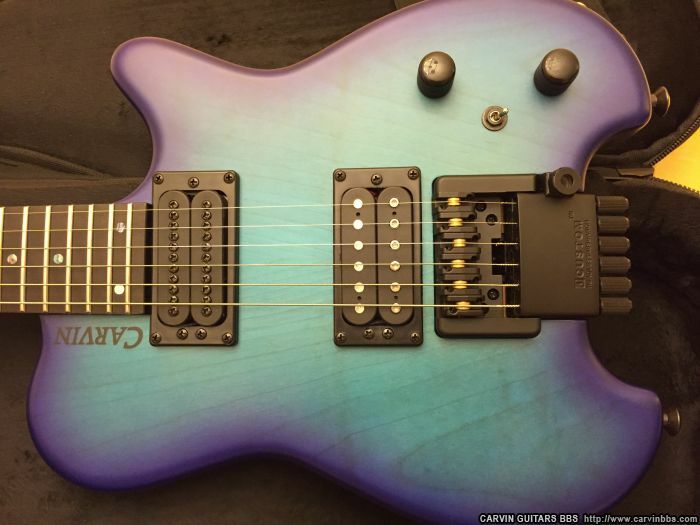 I use Loxx quick-disconnect studs and quick release hardware, with the quick release end mounted to a modified Dimarzio ClipLock strap end. I don't use the disconnect feature of the Dimarzio strap, just the Loxx hardware to attach and remove the strap from the stud. I have always used and liked Dimarzio ClipLock straps, but did not want to permanently mount the ClipLock strap end on my HH1Xs. There is no room in the case for it, and I didn't want them mauling the guitar's finish. I really like Loxx hardware, it is much smaller than the Dunlop system. The Loxx mounting studs have a very small ball end, about half the size of the stock strap stud, so they look great on the HH guitars; very discrete. I use the woven, all cotton version of the ClipLock. Thanks, I'll look into that! The tuning is in fact very stable. It could just be in my mind but I find this one to be bulkier than my first - bigger neck, body, et cetera. It sounds larger as well.